As Bob says, there will be little to report for a month whilst the four eggs are being incubated, and very little to see other than the female sat continuously on the eggs. Although the male will bring food for the female, he will also occasionally take a turn at keeping the eggs warm to allow the female to take a break. 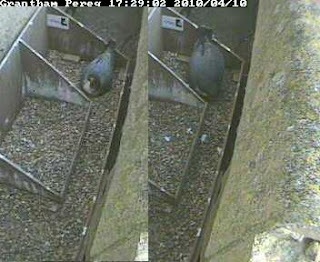 The composite image below, shows the difference in size between the smaller tiercel and his mate.